Alfie the trike has now covered 15,000 miles in two years. This has included cycling through snow, much rain and, last month, flooded cycle paths in Germany. 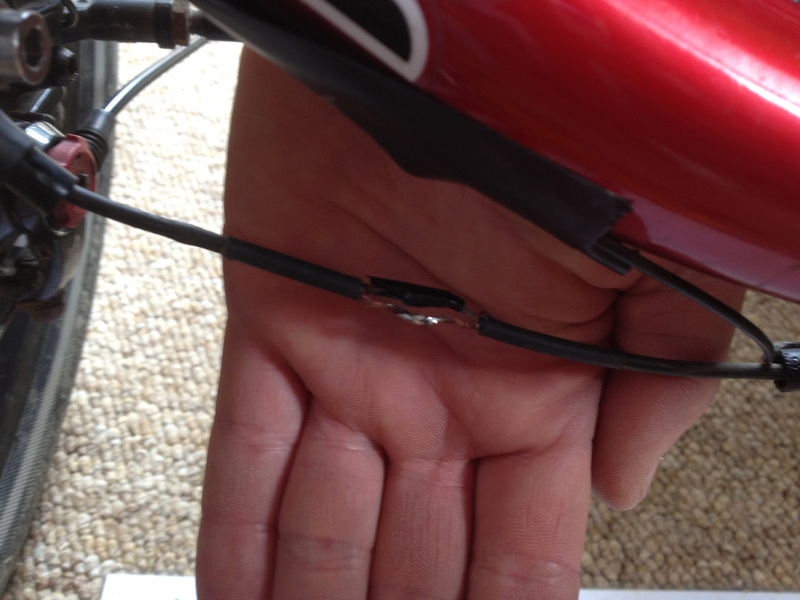 Before I went on my Konstanz to Koblenz cycle tour I did a bit of trike servicing and discovered that I couldn’t remove my front right hand wheel, the one with the SON XS-M dynohub (a wheel hub which contains magnets and other gadgetry to power my front headlight). 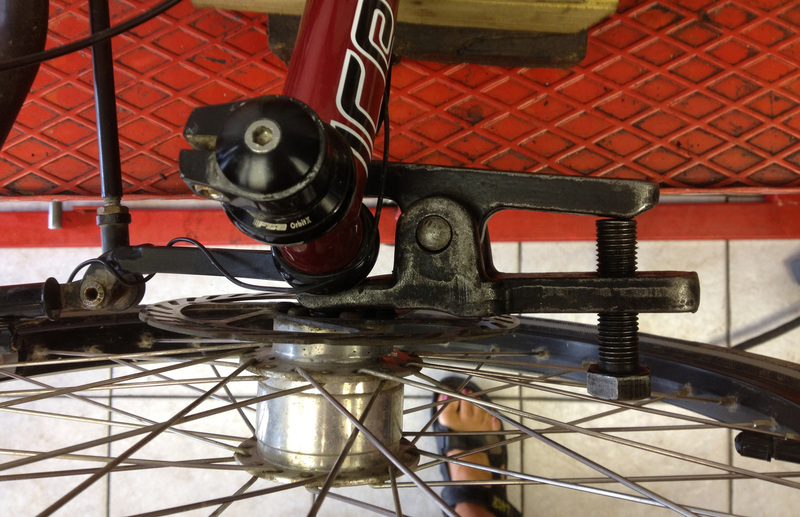 I didn’t try very hard to remove the wheel as I didn’t want to damage the trike before the tour. However, upon my return it was time to try again. 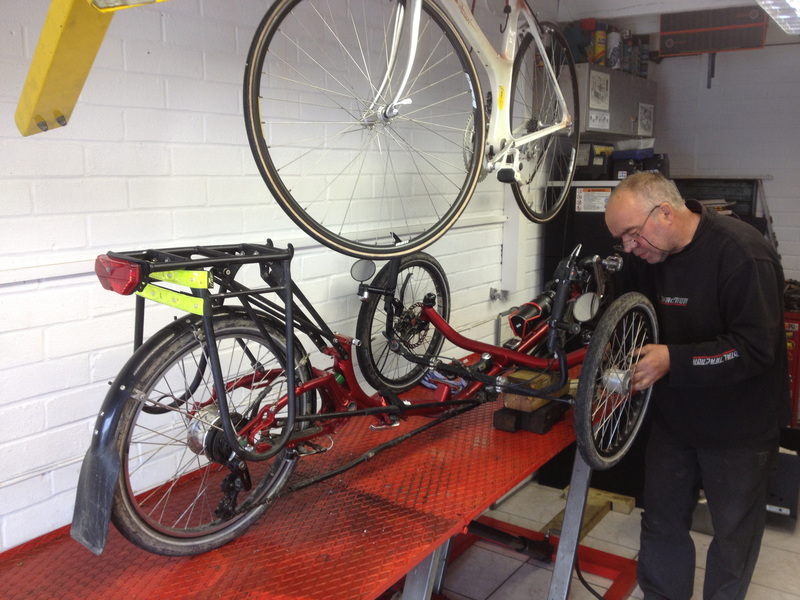 The problem was that I had last removed the wheel in September 2012 when packing the trike into the car for the journey back from Koblenz. 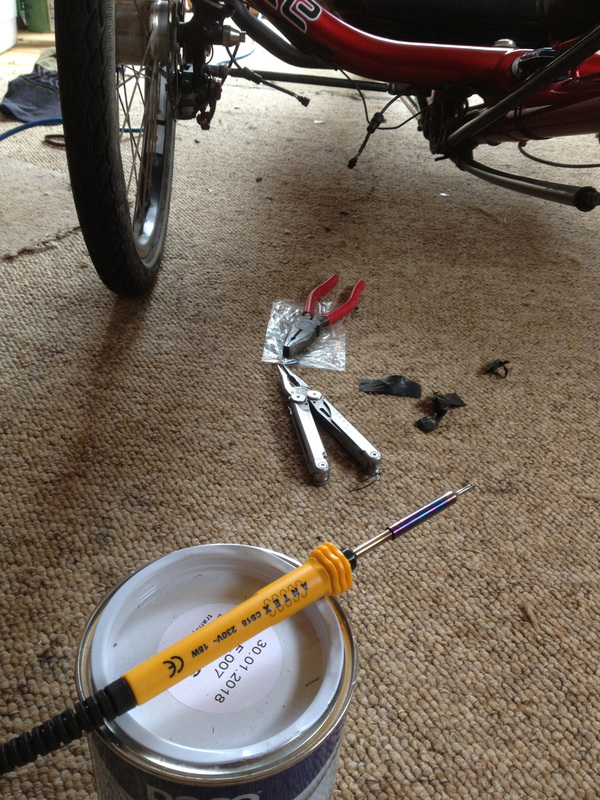 Subsequent to that I had ridden all winter without taking the wheel off (you don’t need to in order to fix punctures). It was highly likely that some corrosion had got in there and caused the problem over the preceding seven months. 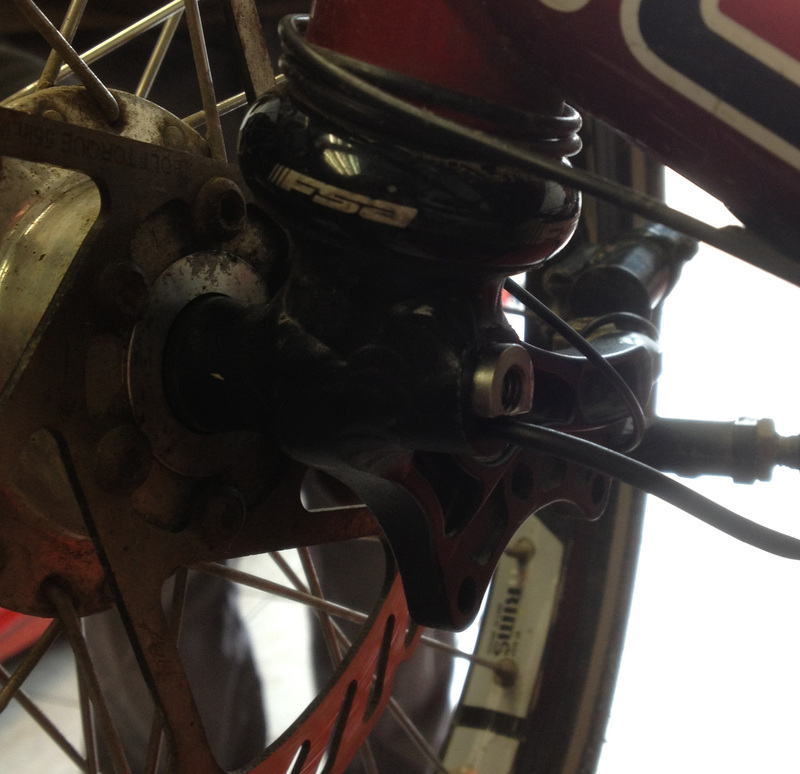 To remove the wheel you first need to take off the disc brake caliper (which is easy enough, just removing two bolts) and then you have to undo the allen bolt and a little metal hoop which allows the cable for the dynohub to escape. So that’s unscrewing the silver bit on the right and then removing the cone-shaped stopper and the silvery metal bit inboard of that as well. When these extra bits were removed you are left with simply the wheel on its axle going through the bottom of the kingpost and the cable dangling free below. I had disconnected the cable from the other end which leads to the light. I had also liberally applied GT85 oil over the previous couple of days to try to make things a bit slipperier. 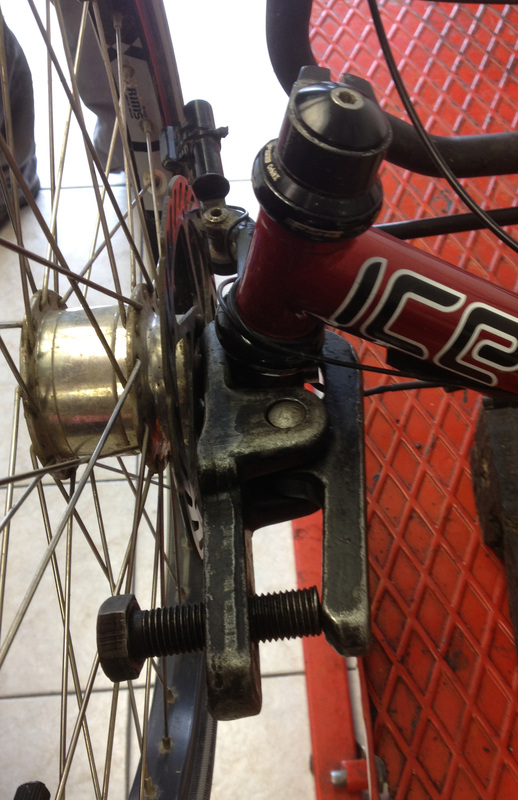 Generally speaking I’m not one for hitting my trikes with a hammer but it seemed the obvious thing to do – we put a block of wood against the metal end of the axle bolt and tap it with a hammer to try to push it through without damaging the end of the axle bolt. So I got on the phone to ICE (Neil Selwood) as usual. They are very familiar with me ringing up for different issues. Neil said they had had another stuck SON dynohub and had managed to free it using the hammer method but rather than hitting a block of wood, which would distribute the force rather widely, they recommended screwing in a sacrificial bolt and hitting that – the shock would hopefully break the corrosion and dislodge the axle bolt from the holder. He also commented that ICE think the SON Dynohub axle is just fractionally larger than ICE’s own axle bolt and that they recommend reaming out the axle a little. So James and I found a sacrificial bolt of the right size (which took a fair while as it’s larger than the usual zillions of spare bolts we have lying about the place), screwed it in to the end of the axle bolt and hit it sharply with a hammer. Many times. It made a nice mess of the head of the sacrificial bolt though so we were clearly doing something. Unfortunately that ‘something’ did not involve releasing the wheel which was as firmly stuck as it had been before we started thwacking the axle bolt. Option 3 – Send it back to ICE? In my phone conversation Neil had said that if I had no joy with the hammer then I could send the wheel back to ICE (I’d have to disconnect the kingpost and trackrods which I had never done but I assumed wasn’t too tricky). This would clearly involve being without the wheel for a few days and as the weather was nice at the moment I decided I’d put this off until we had a weather forecast of rain for a few days. However, another option appeared rather unexpectedly. A year ago I had got chatting to some people at Boxted Airfield (a World War 2 American airbase six miles from my home) after my husband and I had visited the museum there and had a good look around. They had asked why I had a German flag on my trike and I told them I’d just cycled from Berlin to London. To cut a long story short, they asked if I’d do a talk on my cycle ride for the Boxted Airfield Historical Group. Which I said I was very happy to do, but which ended up being scheduled for mid June 2013, well over a year after my Berlin to London ride. Anyway, I went ahead and gave my talk a couple of weeks ago to a very friendly group of people at the Airfield. My trike was with me, of course, and I talked to lots of members of the Historical Group after the event. I must have mentioned to someone about my problems removing the wheel as a chap came up to me, gave me his card and said he was an experienced classic motorcycle mechanic and might be able to help. I took his card, thinking I might contact him if I couldn’t fix this myself (this was before I had tried option 2). So anyway, having failed to remove the wheel after several days of trying it and with the probability of having to send the trike wheel to ICE (and thus a 3-4 day stretch with no trike thus no cycling, not good) I thought it worth phoning Mick Whitnell, this motorcycle mechanic chappie (who also turned out to have been a very decent time trialler some years ago before ill health ended his cycle racing). Mick said he was very happy to have a look at Alfie the trike and see if he could sort this out for me and we fixed up for me to go over there on Thursday morning (yesterday) with Alfie in the car. I rang ICE the day before to see what they might suggest someone with a garage full of tools could do to release my wheel and they said basically just the hammer on the bolt option. 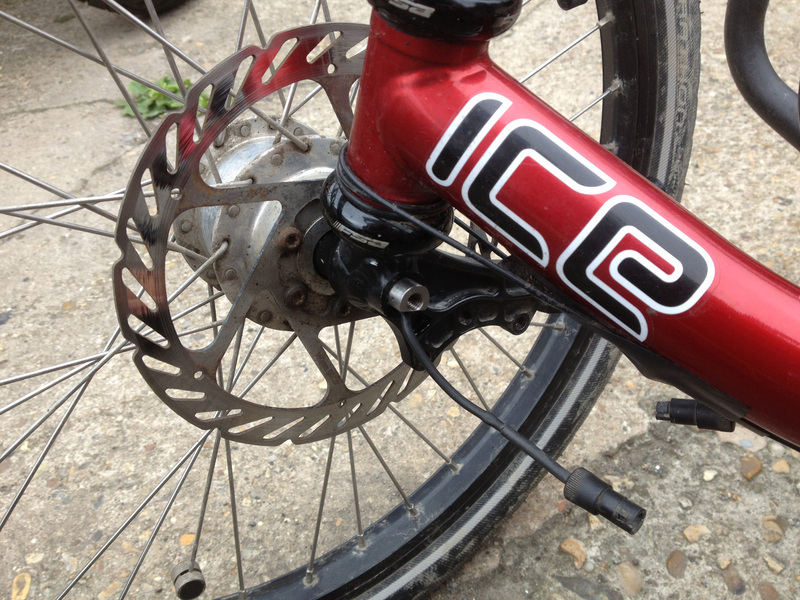 If that didn’t work for ICE then they’d cut away the axle around the bolt and provide a new one. 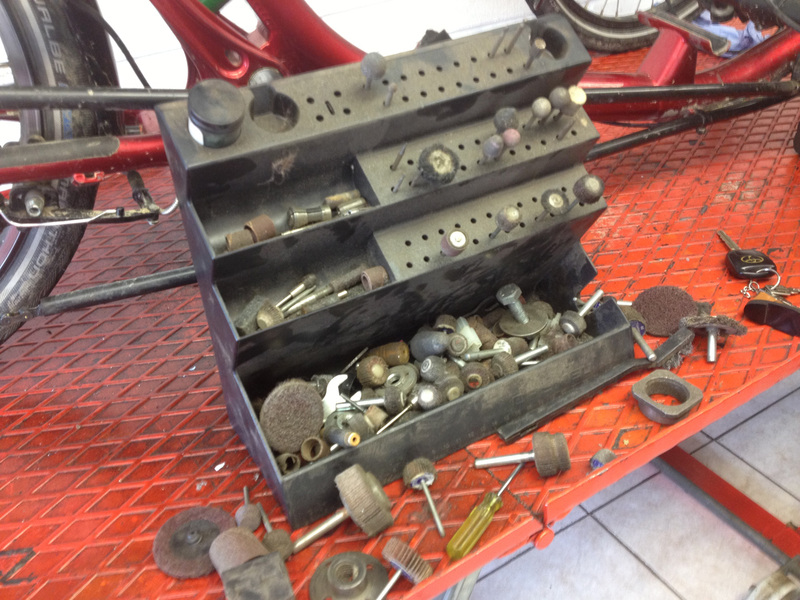 They thought it unlikely a motorcycle mechanic would be able to sort this for me. So I have to admit a certain element of doubt that my trip to Tiptree (where Total Traction are based) would be successful. I was clearly wrong in one respect as when James and I arrived in the car (with Alfie in the boot), we were greeted by Mick and his wife and they had provided us with some cakes!!!!! This is because my Berlin to London talk made lots of mention of nice cakes and both Mick and his wife were there. 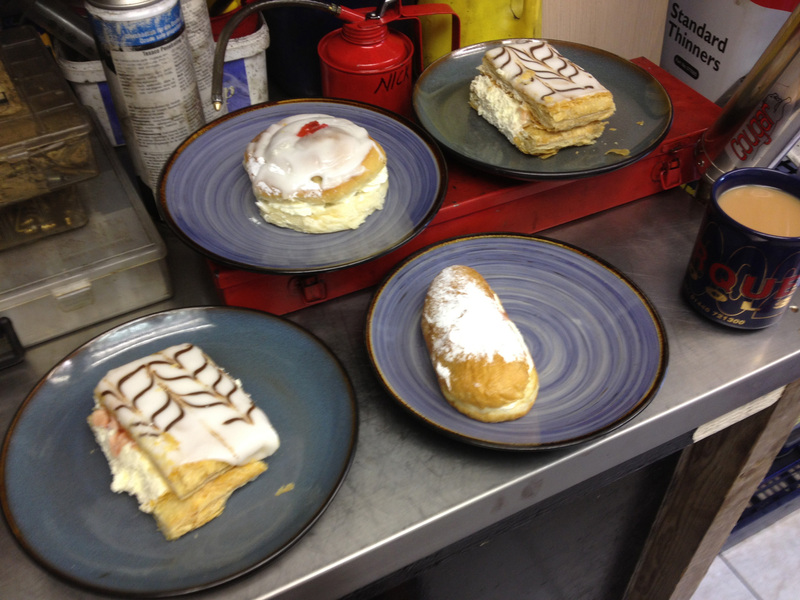 It was extremely kind of them to provide cakes for James and I and we enjoyed eating them, drinking tea and looking at Mick’s Kirk Precision bikes (magnesium ones). After the cake was all gone it was time to have a go at Alfie’s wheel. We lifted him up onto Mick’s workbench and chocked up the relevant side so the wheel spun freely. He fitted another sacrificial bolt on the end of the axle bolt and then fixed the tool in, slowly turning the bolt to open it out and ease the bolt through the axle. We were chatting away as Mick was doing this, discussing his time trialling and talking about his Kirk Precision bike, at which point he commented “that’s working OK”. Lo and behold, indeed it was – the axle bolt was definitely not sticking out as far as it had been! 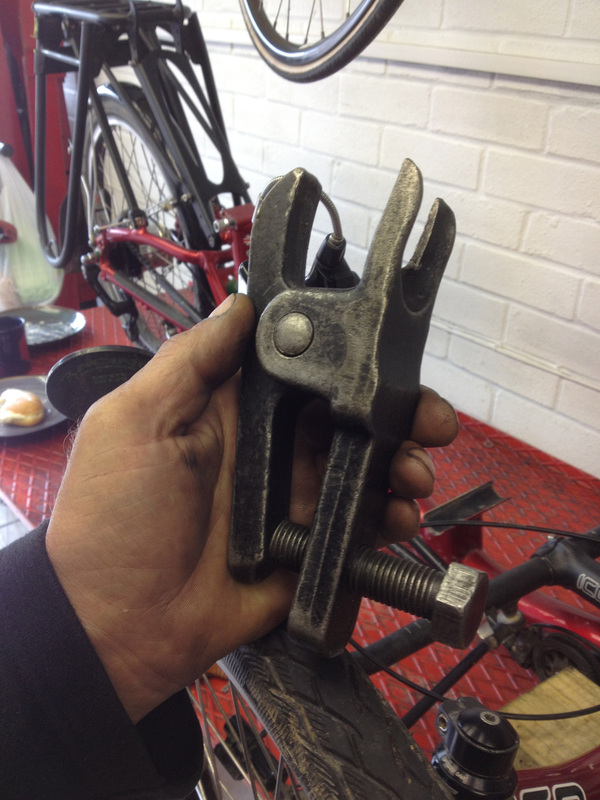 Mick had to use longer and longer bolts screwed into the axle bolt so that the tool could grip it OK without crimping the electrical cable from the hub. When I saw it was at this point I asked if I could just pull the wheel out but Mick said no, it’d still be very difficult to pull (although I think it was because he was worried I might fall backward with the wheel in my arms into his shelving racking with various motorbike bits on it). You can see the corrosion and the remnants of some kind of dried grease on the axle there. 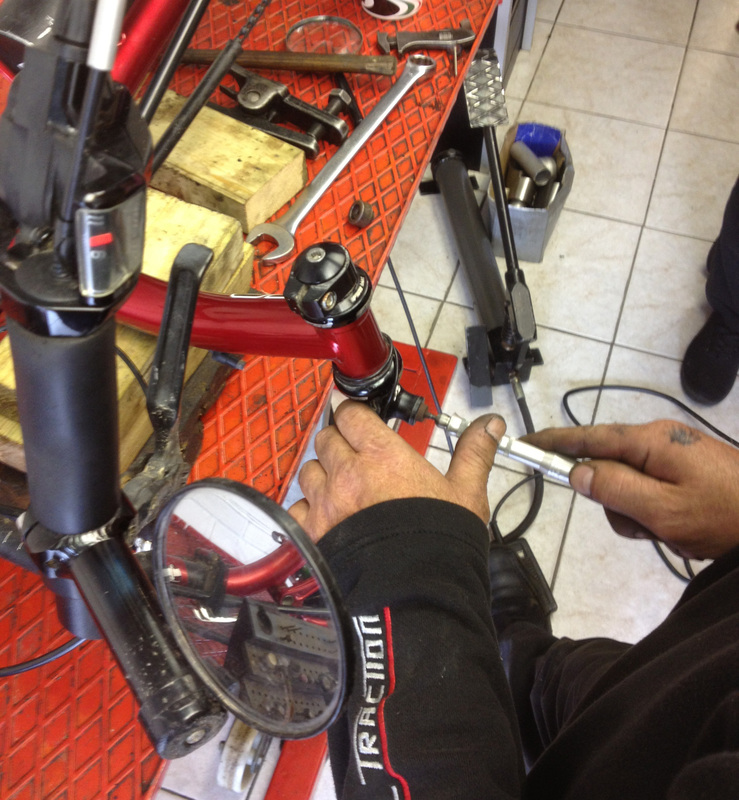 Mick kept on, slowly but surely easing the axle bolt out, until – success! 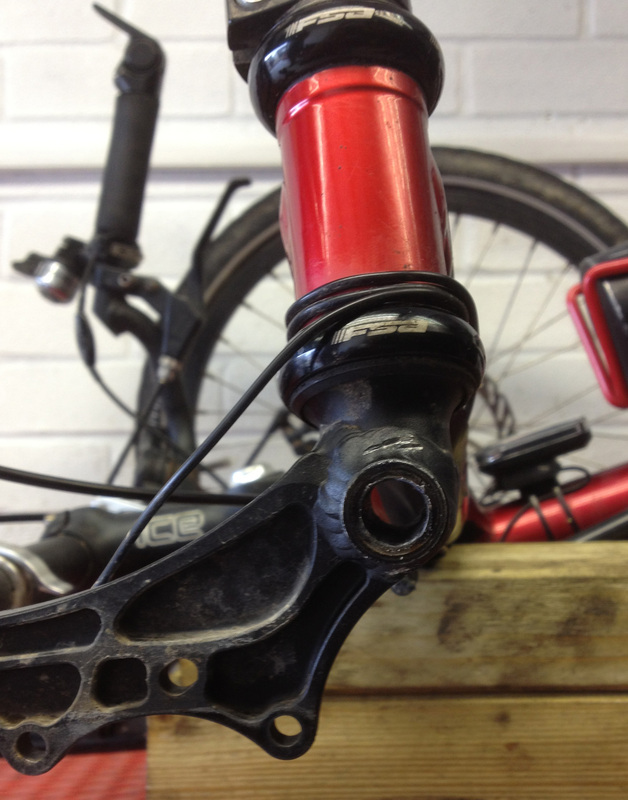 And here is a view I wasn’t expecting to see for a while – the inside edge of my dynohub wheel! Showing very much the result of two winters of riding through bad weather. 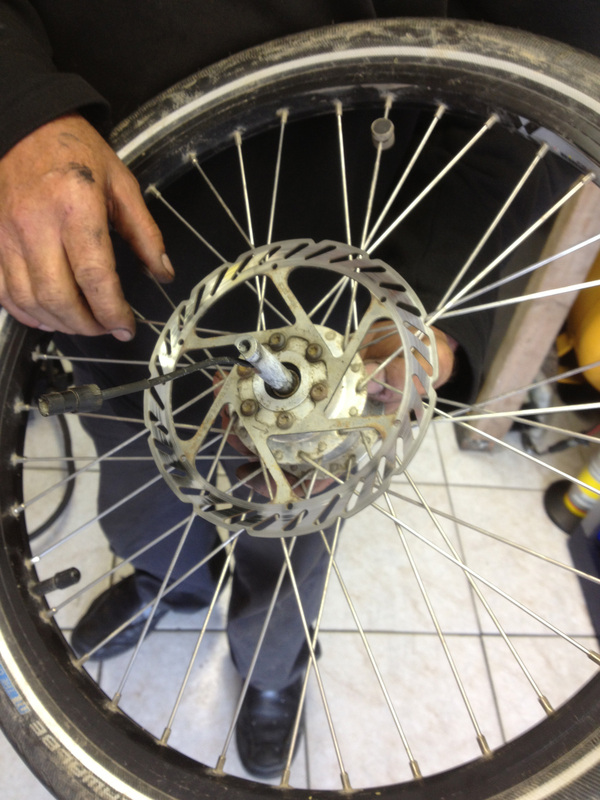 Mick cleaned up the wheel a bit and then it was time to have a look at the axle. You can see that the ball joint remover has slightly bitten into the metalwork on the outside of the axle but this is no problem at all. There was a lot of roughness and grot in the axle so Mick found his dentist’s drill (that wasn’t what it was called but it sounded rather like one) and the right size cleaning head and did a bit of dental surgery on Alfie. When everything was all clean and tidy Mick used some special brake grease stuff to lubricate the axle bolt and fixed the wheel back on (he also gave me a couple of packets of this grease to use in future. And it was made by the company Würth and I remember cycling past their huge factory one day during my Konstanz to Koblenz ride). 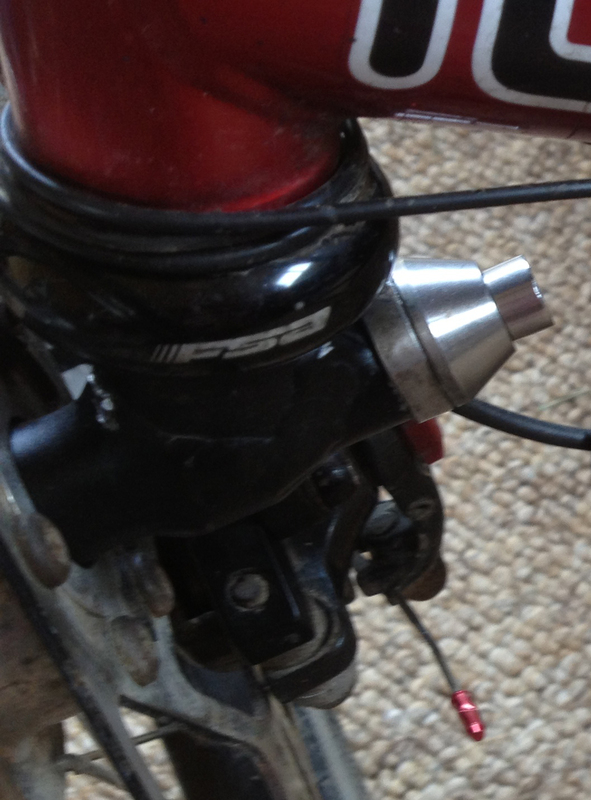 I refitted the brake caliper and rejoined the dynohub cable and we were good to go. Mick had a little ride around the cul-de-sac where he lives to experience the fun of a trike, which was all the payment he would accept for doing all this work on my trike. We were there for two hours in total although we were probably chatting rather than doing bike maintenance for a fairly significant portion of that time! Huge thanks to Mick (and his wife) for their hospitality, the cakes and, of course, for removing my stubborn wheel for me! If you need your motorcycle serviced, repaired, prepared for racing or anything, I can recommend getting in touch with Total Traction in Tiptree at www.totaltraction.co.uk. 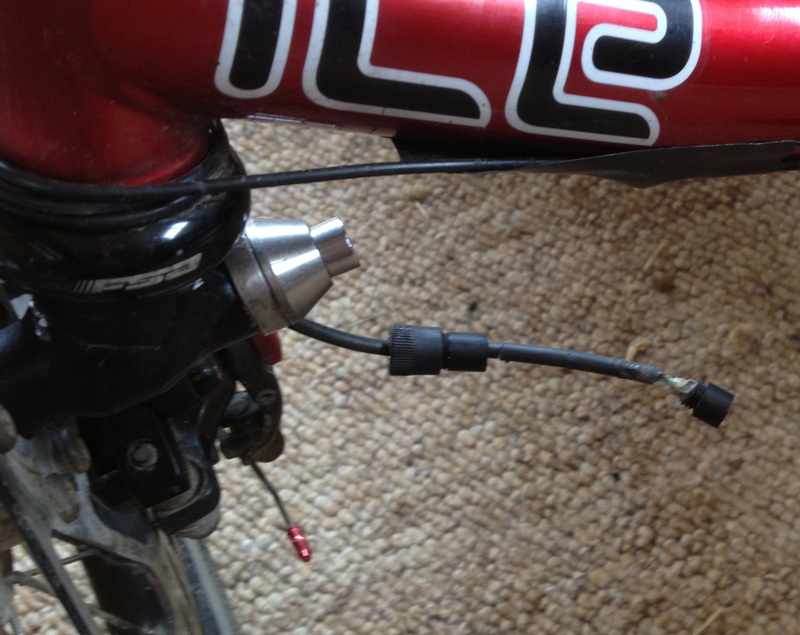 My dynamo headlight was being a bit flaky on my ride home from Tiptree and eventually stopped working. It had worked at Mick’s (although had been a bit reluctant there) so it was likely to be a problem with the connector which is usually left entirely alone but had been detatched a couple of times over the last week. Sure enough, when James my husband (conveniently an electronic engineer) took the cable apart to have a look it we discovered the pins from one side had snapped off into the sockets on the other side. No surprises really as the visible cable, when we unscrewed the housing, was an unfortunate green colour! 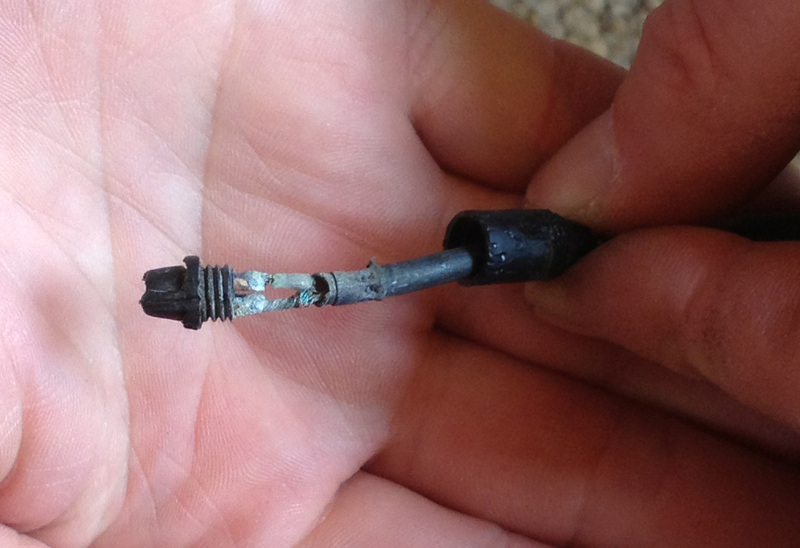 The connector was past it – too much water ingress I suppose, and then I’d been undoing it and snapping it together again over the last few days trying to remove the wheel. We clearly needed a new connector but as I wanted to use the bike that evening in the dark (and we didn’t have a spare connector in stock) James decided to just solder the cable together for me for the time being. He soldered the two bits of cable and, after that was done, wrapped them in insulating tape for the time being. Then it was time to find a replacement connector. They have to be pretty thin as they must thread through the axle (which is 12mm in diameter, I believe). I did a few internet searches with no success due to not knowing exactly what I was asking for. 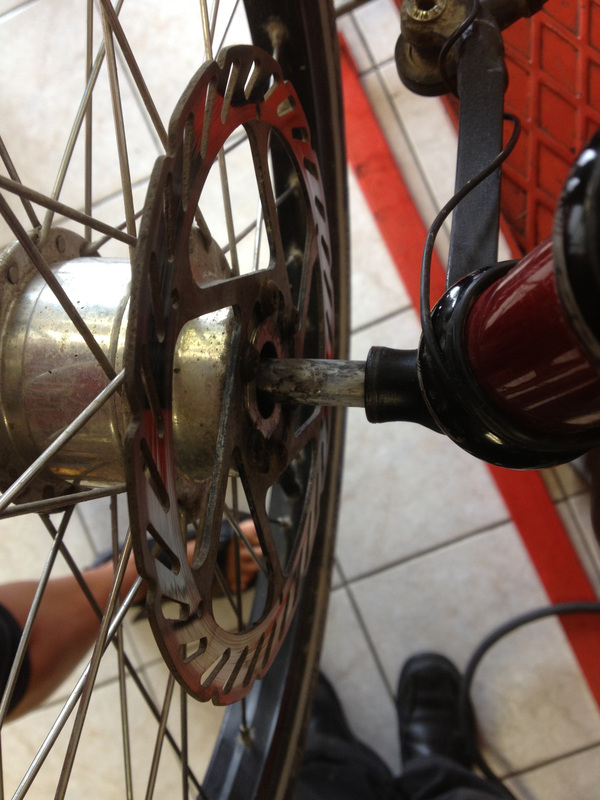 Then it occurred to me to email the manufacturer of the dynohub, Wilfried Schmidt Maschinenbau. I fished out my very comprehensive German dictionary and looked up the word for “connecting widget” (“Verbindungsstecker”) and “connecting pins” (“Steckerstifte”) and fired off an email to them in German asking for advice on where to get these. vielen Dank für den schönen Bericht in gutem deutsch! sortiere nach Preis von unten nach oben. Danke! Die Stecker haben innen jeweils 4 Pole: immer 2 zusammenlöten und mit jeweils einem Leiter aus dem Koaxialkabel verbinden. I had a look and you have to buy both a male and a female plug at £7.99 each (plus presumably P&P) so James is thinking he might cobble together his own connector using some spare phono or mini-jack plugs as long as they are narrow enough to fit through the axle. That’s his next task. We will also move the connector area to the top of the crosspiece on the trike, so further away from the wheel and higher up/away from floodwater. If we can’t get it to work then we’ll buy the official Verbindungsstecker but this is much more fun! With a two year old trike that is used daily and has covered 15,000 miles, much of it in bad weather, I do expect maintenance issues, especially as I’m not one to mollycoddle or pamper the trike, but overall everything seems to be holding up very well under the punishment I dish out with my riding/maintenance style. We now know that we should remove the wheels every couple of months to make sure the axles don’t corrode inside again but hopefully that won’t happen again now Mick has cleaned out the axle and given me the magic grease for them too. The front left hand side wheel came off fine when I tried it the other week – but if it has a slightly narrower axle bolt then that may be why. Thanks once again to ICE for the advice (and the offer of a repair) and of course to Mick for actually fixing this for me. And double bonus that my 12 mile ride back from Tiptree was downwind on a gorgeous day so I had a great bit of cycling too! Always a pleasure to read about your doings and how to overcome the problems as they occur.I feel a bit spoilt because when I cycled on my Trice, found the poor turning circle awkward in the UK, and ended up buying an old Lepus with its super turning abilities. Now living in Berlin I have both trikes, and both are good. The Trice lighter and faster, on the Lepus I sit higher and it is easier in towns. Now 83, I am totally reliant on my two steeds for travelling around . I love reading how you cope with different problems. The main problem is the kingpins are now aluminium and the axles are steel so you get electrolytic corrosion. Greasing (copper grease) and regular disassembly will keep it free. This wasn’t a problem with the old “steel” kingpins on my Trice QNT(2007).